Northern Circumpolar Map for each Month in the Year. Southern Circumpolar Map for each Month in the Year. This is a beautiful hand colored set of the northern and southern circumpolar maps by Elijah Burritt. 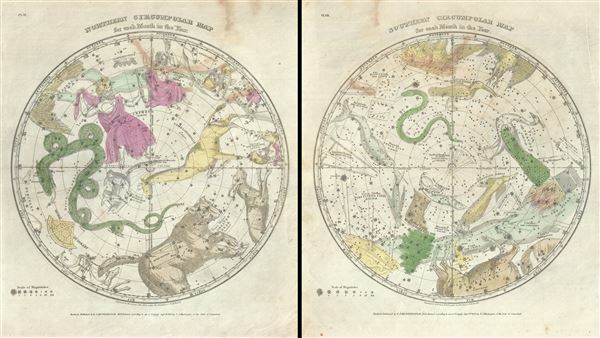 This pair of maps illustrates the night sky and constellations of both the northern hemisphere and southern hemisphere respectively. Constellations are drawn in detail and include depictions of the zodiacal figures the stars are said to represent. Included on these two charts are Ursa Major (Great Bear or Big Dipper), Usra Minor (the Little Bear or Little Dipper), Draco (the Dragono), Cassiopeia (the W), Perseus, Camelopardalis, and Cepheus in the Northern Hemisphere, and Hydra (the Snake), Dorado (the Sword Fish), Pavo (the Peacock) and the Centaur in the Southern Hemisphere. Both charts are quartered by lines indicating the Solstitial and equinoctial Colures. These maps, like all of Burritt's charts, are based on the celestial cartographic work of Pardies and Doppelmayr. Both maps were engraved by W. G. Evans under the direction of E. H. Burritt and issued as plate nos. VI and VII in the New Edition of F. J. Huntington's Atlas, Designed To Illustrate The Geography of The Heavens. The present example is exceptional in that only a small percentage of the first edition of Burrit atlas's featured individually colorized constellations. In subsequent editions, the constellation charts received a general, but non-specific wash. Very good. Minor spotting and overall age toning. Areas of discoloration in top section of both sheets. Set of two maps. Rumsey 2853.004. Kidwell, Peggy Aldrich, Elijah Burritt and the 'Geography of the Heavens. ', Sky & Telescope 69 (Jan 1985).